Wow, so Egypt was pretty cool! We only went for a week and stayed in an all-inclusive resort - an attempt to claw back our honeymoon after its disastrous start back in September (I won't horrify you with the details of my sickness!). Lazy days of hot sunshine, turquoise waters proved I had entered complete bliss! We slept in, ate a late breakfast and swam and snorkelled in the little sea lagoon at our hotel. But on to more important things. My dress! 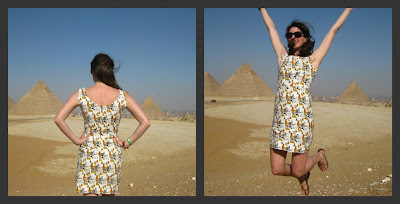 We decided to take a day trip to Cairo to see the Pyramids and I thought this would be the perfect setting to photo my Sixties Cleopatra dress in Egypt. We boarded an Indiana Jones style propeller plane and set off for the hour-long flight to Cairo. Unfortunately, Indiana himself was not there to get me embroiled in some exotic danger ending with a big sweaty dirty kiss. After the mosque, the next stop was the Museum of Eqyptian Antiquities. I completely fell in love with this place. There's a weird surreal feeling when you look at something that has so much art, thought and beauty, yet is almost 4000 years old. It's hard to comprehend. Before us were sculptures, hieroglyphics telling ancient stories, jewellery, it was breathtaking. Our favourite pieces were the coffins and belongings of King Tutankhamun - that boy loved his bling! He was seriously 'golded' up, it was unreal. Unfortunately, you cannot take photos in the museum but here's a link to his funeral mask which is supposedly 24 lbs of solid gold! My kinda guy! After the museum we took a short boat ride on the Nile and stopped off for lunch. Then it was time for the pyramids. Words cannot express the feeling you have when you're standing before the pyramids, it's just breathtaking and you instantly transport your imagination to another time, trying to understand how these men built such a spectacular construction. Obviously the same goes for my dress, thousands looked on in wonder....KIDDING. Anyway, here it is. The great Pyramids of Giza starring The Sixties Cleopatra. I bought a scarf in Hurghada to protect my shoulders/head from the heat. I think it goes with the dress quite well, don't you think? So, that was my latest project being treated to an international photo shoot! I think my next garment might be a bit jealous when the normality of shoddy photos against the backdrop of awful curtains returns! Thanks Gillian! I know, where will I photo my next outfit? The stakes are high.